Tettigoniids are the most speciose of the ensiferan families. Ancestral Permian katydids (Sharov 1968) have diversified into almost 6000 living species in 1070 genera (Otte 1997). These large orthopterans (from 1 to 6 cm) are known as katydids in the New World and Australia-New Zealand (where one also hears "long-horned grasshopper") whereas in Britain and Europe tettigoniids are "bushcrickets" (sauterelles in France, esperanás in Portugal, grillos in Spain, and Laubheuschrecken in Germany (Nickle and Naskrecki 1997)). Katydids are found on all continents except Antarctica and in an assortment of habitats from tropical forests (Heller 1995) and peat bogs (Vickery and Kevan 1985) to montane alpine zones "far above the last outposts of trees"(Tinkham 1944). Within these habitats, virtually all tettigoniids are associated with vegetation, particularly during inactive periods when the insects retreat into (or onto) leaves. These habits are best known for cryptic species whose wings mimic leaves (Belwood 1990; Nickle and Castner 1995) or sticks (Rentz 1993: see title photographs) but even ground-dwelling, flightless katydids will use the cover of vegetation when inactive. In contrast, most other ensiferans use burrows in soil (Kevan 1989) and holes in wood (exceptions include vegetation-inhabiting grylloids such as Eneopterinae and Trigonidiinae). Most katydids are omnivorous, feeding on vegetation, seeds, carrion and occasional prey. There are a few specialists such as the pollen-eating Zaprochilinae (Rentz 1993) and carnivorous Saginae (Kaltenbach 1990). Feeding by katydids can damage crops, but a significant economic impact is rare because population densities are usually low. Exceptions are tettigoniine and conocephaline pests (Jago 1997; Mbata 1992), especially species that aggregate in swarms or bands, e.g. the flightless Mormon crickets (Anabrus simplex) of western North America that migrate in large bands (MacVean 1987). Positive impacts on humans include the use of some katydids as food (MacVean 1987) and as "singing pets" in China where the market price for a "cultured" male songster can reach $US 16.00 (Jin 1993). The use of vegetation by katydids during periods of inactivity (see Introduction) contrasts with the retreat to a burrow or crevice by other ensiferans. These differences appear to be reflected in structure; ensiferan taxa that burrow tend to have forewings that wrap around the body whereas the tegmina of katydids, unconstrained by burrow use, can be held away from the body as "roof-like" structures and modified for acoustical and/or leaf-mimicry purposes (references in Gwynne 1995). Forewing characters that appear to be synapomorphic include a left - over - right overlap of the singing wings in males, a fully - functional stridulatory file on the underside of the left wing and a vestigial file on the right wing. Other synapomorphies include four tarsal segments (also found in the haglid, Prophalangopsis obscura) and, for five species representing four subfamilies, nuclear RNA sequences (Flook and Fraser-Rowell, submitted MS). Male singing begins the mating sequence in virtually all katydids. The wings are raised and a dorsal scraper on the right tegmen is rubbed across a file on the underside of the left tegmen (see figure below). In most species, receptive females respond with silent phonotaxis, but in some females respond acoustically, often using different tegminal mechanisms than males (Nickle and Carlysle 1975; Robinson 1990). In the latter both sexes can move during pair formation. There are four known losses of tegminal stridulation in the family: in a Meconema species, Apteropedetes (Tettigoniinae) and the subfamilies Phasmodinae and Phyllophorinae. Tibial ears (tympana), consisting of just a "slit" in many species, have been lost only in the latter two taxa (Gwynne 1995). The rarity of the loss of singing in Tettigoniidae contrasts with that of grylloids where there have been a number of losses in most subgroups (Otte 1992). A male tettigoniid faces forward, displaying the sound-generating structures of the tegmina (forewings): a mirror or modified wing cell that radiates sound produced by shocks from the passage of a scraper along a line of teeth (the file). The tegmina with file and scraper visible, are also shown (above right) from beneath. The insect's ears are on its forelegs, each double eardrum backed by an acoustic trachea that runs up the leg, swells into a horn-like internal chamber and finally opens on the thorax via an acoustic spiracle. Sounds can arrive at both the front and the back of the tympana. (The acoustic tracheal system is drawn as if the insect were transparent.) Drawing reprinted with permission from Morris 1998, copyright © 1998 Elsevier Science. During copulation males of most species transfer a spermatophylax as part of the spermatophore, a meal that the female eats after the pair separates (Fabre 1896). Nutrition from this mating gift can be important to female reproduction and, in some species, it is associated with a reversal in the typical "mating roles" such that females compete for access to males and males show mating preferences (Brown and Gwynne 1997). The mated female oviposits into plant tissue or soil. The latter is apparently ancestral as soil oviposition also occurs in the related families Stenopelmatidae and Gryllacrididae. The Phaneropterinae in particular exhibit a striking diversity of oviposition sites, including crevices in bark (Leptophyes (Duncan 1960)), cementing eggs onto twigs like overlapping roof shingles (Microcentrum (Riley 1874)) injecting them into the pith of twigs (Zabalius apicalis (Eluwa 1975)) or leaf tissue between the epidermal layers (e.g. Euthyrachis (Leroy 1969) and Phaneroptera (Grasse 1924)), and even plastering the eggs into a mud "nest" onto stones and twigs (Caedicia simplex, New Zealand's "kikihipounami" (Lysaght 1931)). The egg as the overwintering stage and a single generation per year is the most common life-history in species experiencing distinct seasons (e.g. Isely 1941). Although a single period of cold is the only required diapause for many of these species, others can require up to five winters before all the eggs hatch (Ingrisch 1990). In warmer climes there can be two annual bouts of oviposition resulting in two overlapping generations (Ando 1991) or continuously overlapping generations where all stages of the life cycle are present year round (e.g. Hexacentrus (Robinson and Pratt 1975)). After hatching, larvae pass through four to nine instars, depending on the species, before adulthood (Ramsay 1964). Lists of subfamilies by Zeuner (1936) and Ander (1939) have been changed or added to in more recent works (Rentz 1979; Kevan 1982; Gorochov 1988; Otte 1997). (Kevan (1982), Gorochov (1988), and Ingrisch (1995) raise several katydid subgroups to family rank). The subfamily arrangement will probably continue to change as knowledge of the world's fauna improves (e.g. see the revisionary studies of Rentz (1979, 1985, 1993), Naskrecki (1994, 1996) and Ingrisch (1995)) and character analyses are used to determine tettigoniid relationships and whether subfamilies represent monophyletic groups (see Nickle and Naskrecki 1997 for details). The above phylogeny is modified from Gorochov (1988), the only recently published tree of most subfamilies. The tree is based on a detailed morphological study but not on a formal analysis of characters (see Nickle and Naskrecki 1997). Our only changes to the terminal taxa in the tree are to use the taxonomic ranks and subfamilies in Otte's (1997) catalogue. Gorochov was apparently uncertain about the placement of Microtettigoniinae as he used a dashed line to connect this taxon to Meconematinae. (Rentz (1979) allied the microtettigoniines to the Conocephalinae; for consistency, we follow Gorochov). Gorochov's tree does not include three recently described subfamilies: Ingrisch (1995) erected the Lipotactinae, which he argues is closely relalated to Meconematinae; Rentz (1993) erected Zaprochilinae (a group he described as most closely related to phasmodines) and Austrosaginae (which phenetic and cladistic analyses (Colless, in Rentz, 1993) suggest to be closely allied to Listroscelidinae). Note that an assumption in this arrangement as in any phylogeny is that each of the terminal taxa in the phylogeny is a natural group. This assumption is likely to be violated for some of the currently recognized subfamilies (Nickle and Naskrecki 1997). The only other recent study that sheds light on the higher groupings of Tettigoniidae is not congruent with Gorochov's. Flook and Fraser-Rowell's (submitted) parsimony analysis of nuclear RNA sequences for the Ensifera includes five katydid species representing four subfamilies. In this topology, a mecopodine species groups with a tettigoniine with this clade being the sister taxon of two conocephalines (from tribes Copiphorini and Conocephalini). The listroscelidine species forms the basal group for the five tettigoniid taxa. Ando, Y. 1991. Photoperiodic control of adult diapause in a subtropical katydid, Euconocephalus pallidus Redtenbacher (Orthoptera: Tettigoniidae). Appl. Ent. Zool. 26:347-355. Belwood, J.J. 1990. Anti-predator defences and ecology of neotropical forest katydids, especially the Pseudophyllinae. In The Tettigoniidae: Biology, Systematics and Evolution, ed. by W. J. Bailey and D. C. F. Rentz, Bathurst, Australia, Crawford House. Pp. 8-26. Brown, W.D., and D.T. Gwynne. 1997. Evolution of mating in crickets, katydids, and wetas (Ensifera). In The Bionomics of Grasshoppers, Katydids and their Kin, ed. by S. K. Gangwere, M. C. Mulalirangen and M. Muralirangen, Oxford, CAB International. Pp. 279-312. Duncan, C.J. 1960. The biology of Leptophyes punctatissima (Bosc.) (Orthoptera: Tettigonidae). Entomol. 93:76-78. Eluwa, M.C. 1975. The egg-laying habits of Zabalius apicalis Bolivar (Orthoptera: Tettigoniidae). J. Nat. Hist. 9:41-49. Fabre, J.-H. 1896. Etude sur les locustiens. Annales des Sciences Naturelles -- Zoologie 33:221-244. Gorochov, A.V. 1988. The classification and phylogeny of grasshoppers (Gryllida - Orthoptera, Tettigonioidea). In The Cretaceous Biocoenotic Crisis and the Evolution of Insects, ed. by A. Pomerenko, Moscow, Hayka. Pp. 145-190. Grasse, P.P. 1924. Etude biologique sur Phaneroptera 4-punctata Br. et Ph. falcata Scop. :454-472. Gwynne, D. T. 1995. Phylogeny of the Ensifera (Orthoptera): a hypothesis supporting multiple origins of acoustical signalling, complex spermatophores and maternal care in crickets, katydids, and weta. J. Orthop. Res. 4:203-218. Gwynne, D. T. 2001. Katydids and Bush-crickets: Reproductive Behavior and Evolution of the Tettigoniidae. Ithaca, Cornell University Press. Heller, K. G. 1995. Acoustic signaling in palaeotropical bush-crickets (Orthoptera, Tettigonioidea, Pseudophyllidae): does predation pressure by eavesdropping enemies differ in the palaeotropics and neotropics. J. Zool. 237:469-485. Ingrisch, S. 1990. Significance of seasonal adaptations in Tettigoniidae. Bol. San. Veg. Plagas (Fuera de serie) 20:209-218. Ingrisch, S. 1995. Revision of the Lipotactinae, a new subfamily ofTettigonioidea (Ensifera). Entomol. Scand. 26:273-320. Isely, F.B. 1941. Researches concerning Texas Tettigoniidae. Ecol. Monogr. 11:457-475. Jago, N.D. 1997. Crop-centred integrated pest management in grasshoppers and other Orthoptera. In The Bionomics of Grasshoppers, Katydids and their Kin, ed. by S. K. Gangwere, M. C. Mulalirangen and M. Muralirangen, Oxford, CAB International. Pp. 443-480. Jin, X -B. 1993. Katydids and crickets do have commercial value! An insight into the insect market in China. Metalepea 14:4. Kaltenbach, A.P. 1990. The predatory Saginae. In The Tettigoniidae Biology, Systematics and Evolution, ed. by W. J. Bailey and D. C. F. Rentz, Bathurst, Australia, Crawford House. Pp. 280-302. Kevan, D.K. McE. 1982. Orthoptera. In Synopsis and Classification of Living Organisms, ed. by S. P. Parker, New York, McGraw Hill. Pp. 352-383. Leroy, Y. 1969. Quelques aspects de la reproduction des Tettigonioidea de Trinidad [Orth.]. Ann. Soc. Ent. Fr. (N.S.) 5:775-798. Lysaght, A.M. 1931. Biological notes on a long-horned grasshopper, Cedecia simplex (Walk.). N.Z. J. Sci. Tech. 12:296-303. MacVean, C.M. 1987. Ecology and management of the Mormon cricket, Anabrus simplex Haldeman. In Integrated Pest Management on Rangeland: A Shortgrass Prairie Perspective, ed. by J. L. Capinera, Boulder, Colo, Westview Press. Pp. 116-136. Mbata, K.J. 1992. The biology and host plant specificity of Acanthoplus speiseri Brancsik (Orthoptera: Tettigoniidae: Hetrodinae), a pest of grain crops. J. ent. Soc. sth. Afr. 55:99-106. Morris, G.K. 1998. Songs of Arthropods, pp. 508-517. In Knobil, E. & Neill, J.D. (Eds), Encyclopedia of Reproduction, Academic Press. Naskrecki, P. 1994. The Mecopodinae of southern Africa (Orthoptera: Tettigonioidea: Tettigoniidae). J. Afr. Zool. 108:279-320. Nastrecki, P. 1996. Systematics of the southern African Meconematinae (Orthoptera: Tettigoniidae). J. Afr. Zool. 110:159-193. Nickle, D.A., and T.C. Carlysle. 1975. 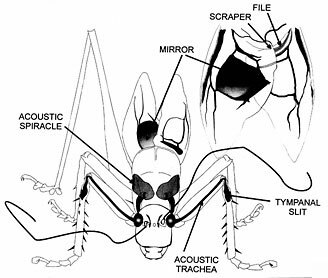 Morphology and function of female sound-producing structures in ensiferan Orthoptera with special emphasis on the Phaneropterinae. Int. J. Insect Morphol. & Embryol. 4:159-168. Nickle, D.A., and J.L. Castner. 1995. Strategies utilized by katydids (Orthoptera: Tettigoniidae) against diurnal predators in rainforests of northeastern Peru. J. Orthop. Res. 4:75 - 88. Nickle, D.A., and P.A. Naskrecki. 1997. Recent developments in the sytematics of Tettigoniidae and Gryllidae. In The Bionomics of Grasshoppers, Katydids and their Kin, ed. by S. K. Gangwere, M. C. Muralirangan and M. Muralirangan, Wallingford, U.K., CAB International. Pp. 41-58. Otte, D. 1992. Evolution of cricket songs. J. Orthop.a Res. 1:25-47. Ramsay, G.W. 1964. Moult Number in Orthoptera (Insecta). New Zealand J. Sci. 7:644-666. Rentz, D.C.F. 1979. Comments on the classification of the orthopteran familiy Tettigoniidae, with a key to subfamilies and description of two new subfamilies. Aust. J. Zool. 27:991-1013. Rentz, D.C.F. 1985. A Monograph of the Tettigoniidae of Australia: Volume 1: The Tettigoniinae. Melbourne: CSIRO. Rentz, D.C.F. 1993. A Monograph of the Tettigoniidae of Australia: Volume 2: The Austrosaginae, Phasmodinae and Zaprochilinae. Melbourne: CSIRO. Riley, C.V. 1874. Katydids. In Report on the noxious, beneficial, and other insects of the State of Missouri, State Entomologist. Pp. 150-169. Robinson, D. 1990. Acoustic communication between the sexes in bushcrickets. In The Tettigoniidae: Systematics and Evolution, ed. by W. Bailey and D. C. F. Rentz, Bathurst, Australia, Crawford House. Pp. 112-129. Robinson, M.H., and T. Pratt. 1975. The phenology of Hexacentrus mundus at Wau, Papau New Guinea (Orthoptera: Tettigoniidae). Psyche 82:315-322. Tinkham, E.R. 1944. Biological, taxonomic and faunistic studies on the shield-back katydids of the North American deserts. Amer. Midl. Nat. 31:257-328. Vickery, V.R., and D.K. McE Kevan. 1985. The Grasshoppers, Crickets and Related Insects of Canada and Adjacent Regions. Ottawa: Canadian Government Services. Zeuner, F. E. 1936. The subfamilies of Tettigoniidae (Orthoptera). Proc. Roy. Entomol. Soc. Lond. (B) 5:103-109.